Before I get bored and want to start a new cool hobby project, I wanted to report the current status of the web app. I used the p2.js debug renderer and polished it up a bit. Then I added some Angular.js magic. 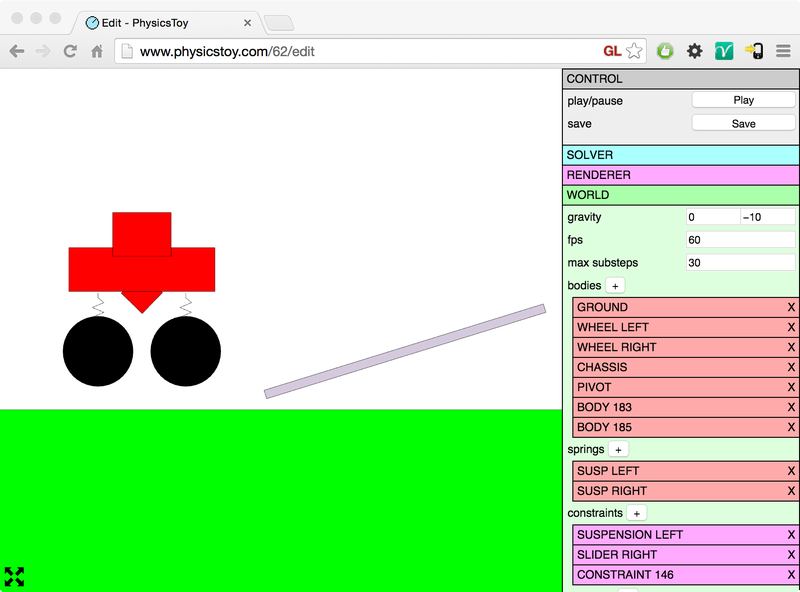 I’ve wanted to learn Angular for a while, and PhysicsToy was a great project to use it in. I hooked up Angular and connected it to a simple list-like menu. Then added some code for updating the p2.js world as the angular data changes. Viola, PhysicsToy was born. Another thing I wanted to try was Postgres. I’ve been using MySQL in other projects, but why not try something new, and at the same time choose open source. Postgres didn’t let me down. It offered a JSON data type, which is convenient for my Angular scene data. Postgres seems more consistent and in general more thought through than MySQL, even though they are based on the same SQL language. Before pushing the data to Postgres, I do some validation using JSON-schema. I use an interesting solution for version handling of the JSON: I store the scene data as it is and never upgrade it in the database, but I do on-the-fly upgrading when serving to the clients. The benefits of this solution are that the original scenes can be in all servers forever. And it’s ideal when the app is under development, with a constantly changing data model. The only bad part is that the upgrading takes some server juice. Had a fun time coding this, I hope that it will grow to something big!